"Dracula, published in 1897, is one of the all-time great money-making novels." 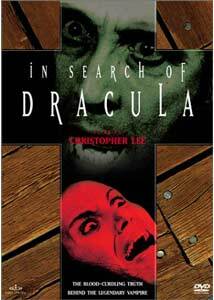 Directed by Sweden's own Calvin Floyd (The Terror of Frankenstein), this documentary is based on the best-selling book In Search of Dracula, written by Raymond McNally and Radu Florescu, which was released in the early 1970s. Having Christopher Lee, one of the most iconic representations of Dracula in all of horror, narrate this 1974 Independent-International Pictures docu on the myths and origins of the most famous of all vampires was certainly a cool move by Floyd. Lee, with that gloriously deep voice of his, offers up the perfunctory narration with a twinge of appropriate melodrama that makes even the simplest line drip with creepy drama. Over the course of an obviously padded 82 minutes, Floyd and Lee dispense ample background on Bram Stoker's writings, the legend of Vlad Tsepes, and a general dose of Transylvanian history that more than fills in the cracks on how the legend of Dracula may have originated. In true Independent-International Pictures fashion, the documentary is beefed up with gratuitous footage from a 1970 Roy Ward Baker film called Scars of Dracula (not ironically starring Lee), and while much of the footage works exceptionally well, there a few narration-free sequences that drag on a bit, giving the appearance of being nothing more than unadulterated filler. This intentional padding is even more obvious during a segment on Bela Lugosi (a requirement), that features a very long clip from his silent film, The Midnight Girl, and an even more unrelated piece on silent film star Theda Bara (not really a requirement) that also incorporates an overly long clip from one of her films. Footage from F.W. Murnau's Nosferatu is used to great effect, and while I never tire of seeing Max Schreck skulk around, there really wasn't any valuable insight offered on that monumental and legendary horror film. Even Mary Shelley gets about ten minutes worth of discussion, and though the subject matter is similar in genre terms, presenting the roots of the Frankenstein mythos seemed just as out of place as Bara. These obvious time-filling techniques do tend to drag down the overall enjoyment level of In Search of Dracula, and the exploitative Independent-International Pictures touch is readily apparent, right from the garish title sequence that seems to go on forever. The low-rent horror influences aside, the middle portion, which goes in-depth on Vlad Tsepes and vampire lore, is genuinely fascinating, even amidst prolonged stock footage of Romanian peasants and Lee-as-Dracula stalking a nubile, young villager. Image Transfer Review: The 1.33:1 full-frame transfer is largely a grainy, speckled, nicked affair that is far from being what anyone would likely consider to be a "good looking" presentation. The quality of the footage used here varies greatly, and it is odd that the clip from Lugosi's The Midnight Girl (1925) looks better than does Scars of Dracula (1970). The "newer" footage from the early 1970s suffers from the usual ailments of low-budget filmmaking, which include faded colors and often impenetrable black levels, as well. The unevenness and condition of the source material notwithstanding, the general look of this disc is certainly a bit rough. Audio Transfer Review: The English mono track is tolerable, with at least Lee's voice always coming through clear and discernible. Dynamic range is noticeably limited, and often times the background score comes across with an ear-piercing shrillness. The track is generally on par with an understandably flat, 1970s low-budget horror genre presentation. Sometimes acceptable, sometimes awful. Extras Review: The highlight here is a three-page booklet written by Jim Arena that chronicles the history of In Search of Dracula, and includes comments from legendary Independent-International Pictures producer Sam Sherman. Also included are an oddball batch of trailers and a dull ten-image Photo Gallery. The disc is cut into a spartan 12 chapters, and does not include subtitles. Horror fans, especially those with a built-in tolerance and appreciation of the often campy Independent-International Pictures style, should take a chance on this well-meaning but poorly edited 1974 documentary. While the simple duality of vampires AND Christopher Lee should be enough to merit a peek, you might find that you actually learn something here.